Do you own one of those vacuums that won’t work on your tile floors? There’s nothing as annoying as working on your floor for like an hour only to realize that not all dirt has been sucked in by the vacuum. If you have tile floors in some or all the rooms in your home, it is advisable that you get the best vacuum for tile floors for a hassle-free cleanup job. Today, we take a look at the top 10 best vacuums for tile floors. e) Are there other floor types? The main advantage of tiles, especially ceramic, is that they can last for ages if installed properly. Due to their ability to resist wear and tear, tiles can serve you for as long as 20 years or more. Tiles are also quite hard to crack. However, in case an object falls on the floor and a tile cracks, replacing it is a breeze. Tiles are quite easy to clean. If stained, you just need to use a mop and the basic household cleaning agents to get the job done. If there are any dirt and debris on the tiles, simply pass a vacuum over the floor and you’re done. We are not implying that tiles are the cheapest flooring options. Ceramic tiles, for example, cost less than 5 bucks per square foot. If you decide to go for DIY installations, the overall cost will be lower than say hardwood flooring. However, if the design is more complex and you hire professionals to do the installation, the cost will be a bit higher. You will always get the best tiles to suit your tastes and preferences. There are different shapes, patterns, sizes, and textures. So, you can always get tiles that match the color of your walls, furniture or house set up. To get the most out of the vacuum you select for your tile flooring, there are some things you need to keep in mind. At the end of the day, you are not buying a vacuum for the sake of it. You want one that is effective in its job. A vacuum that always leaves some dirt or debris is definitely a bad choice. A lot of dirt and debris tends to hide in the grout, so you need a vacuum with a strong suction for a thorough job. A lot of dust, pollen and other allergens tend to settle on tile floors. So, a good vacuum should not allow such pollutants to get back into the air after vacuuming. If any of the occupants are asthmatic or suffer from allergies, it is advisable to get a vacuum with a high-quality filtration system. In that case, I’d go for one with HEPA filtration. HEPA filters trap up to 99.97 percent of allergens (source). You don’t want a vacuum that slips as you vacuum. This may result in a below-par job, damage to the equipment or even injury. So, always look out for a vacuum with rubber wheels which allow the vacuum to glide easily on the surface without sliding off. Even though this is not mandatory, a vacuum that gives you both wet and dry options is great. This ensures that you take care of stains, dirt, and debris at the same time. It saves you the struggle of mopping first then vacuuming. Also, if you have quarry tiles that are a bit harder to clean, you need a unit with the wash option. A great choice, in this case, is our top pick in the best vacuum for tile floors category, the Bissell CrossWave Pet Pro. In this article, we are focusing on vacuums that are ideal for tile floors. However, there may be other floor types in the house. For example, you may have a combination of carpet and tile in the same room or other rooms with totally different floor types such as hardwood. Of course, you don’t need a vacuum for every surface type. You have to go for a vacuum that is versatile in order to cut on costs. Our top pick in the best vacuum for tile floors is the Bissell CrossWave Pet Pro. This all in one wet/dry vacuum does a magnificent job on tile flooring. Apart from that, it comes in handy if you have other floor types such as hardwood or carpet. So, you don’t have to buy another hardwood floor vacuum. It also cleans area rugs and handles pet hair effectively. Its innovative features make it stand out from the rest. The vacuum is designed to let you wash and vacuum simultaneously. When it comes to vacuuming, a multi-surface pet brush roll rotates at 3000RPM to get rid of dirt on your tile floor or any other floor type in your home. A pet hair strainer in the dirt tank separates and traps pet hair, making it easy to empty. Also, when washing the floor, a specialized two-tank system separates the cleaning solution from dirty water so that you don’t do zero work. The vacuum also uses a cleaning solution that helps get rid of odors from the floor so that your house smells clean and fresh. Lastly, the lightweight vacuum is quite easy to use. At the touch of a button (on the handle), you can conveniently switch between vacuuming the floor to cleaning area rugs. Click here to see the current price of the Bissell CrossWave Pet Pro 2306A. Another vacuum that is perfect for tile flooring is the BISSELL PowerEdge 81L2A. Bissell has made some of the best vacuums in the market over the years, and the 81L2A is one of them. 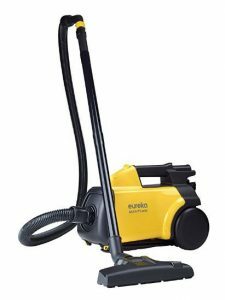 It is specifically designed to tackle dirt and debris on hard floors. So, it should work perfectly on tile floors. The vacuum has powerful, consistent suction and is so easy to use. Without the need of attachments, this V-shaped lightweight vacuum is compact enough to reach and clean tight spots. It has a swivel head that makes it easy to navigate around obstacles such as furniture as you vacuum. The floor head’s V-shape also helps to maximize suction of dirt and debris into the vacuum. First, V-shaped wipers force the large debris into the center suction path. The wipers are made of rubber, which helps pet hair from the floor. Then, other fine particles are sucked in along the arms. Lastly, a 20-foot power cord allows you to clean a large area without the need to change the power outlet. Also, the dirt cup is easy to empty. Click here to see the current price of the BISSELL PowerEdge 81L2A. Are you just too lazy to vacuum the house? Or are you swamped with work that you don’t have enough time to clean up? If any of these instances are applicable to you, you need to take advantage of technology. Get a robot vacuum to do the work for you. 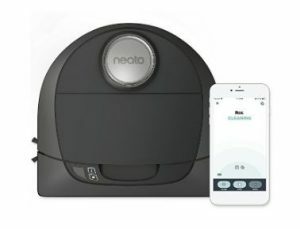 There are some awesome robot vacuums out there, but we nominate the Neato Botvac D5 Connected as the best robot vacuum for tile floors. And this is due to the interesting features it has as well as the outstanding capability to get the job done effectively. What this vacuum does is to first scan and map out the room using LaserSmart technology. Instead of moving randomly, it then navigates the room in straight lines following the patterns that have already been mapped out. Even if it’s already dark, the vacuum will use the laser technology to clean the room. If there are pets in the house, the vacuum has a side brush that helps to pick up pet hair even along the walls. Also, the Neato Botvac D5 uses an ultra-performance filter to prevent up to 99 percent of allergens from getting back into the air. This helps fight allergies and asthma attacks. The best thing about robots is the use of advanced technology for convenience. First, using the Neato app on your smartphone or smartwatch, you can schedule cleaning duties for the vacuum depending on your preference. Then, the vacuum can take commands from other devices such as the Google Home or Amazon Echo. Click here to see the current price of the Neato Botvac D5. If you are a fan of hand vacuums, then this is for you. The BLACK+DECKER BDH2020FLFH can be converted into a stick vacuum in the blink of an eye. It comes with a stick vacuum floor head attachment that comes in handy when you need to do a more extensive, thorough cleaning. If you live with cats or dogs in the house, a rubberized pet hair brush attachment helps to get rid of pet hair. The vacuum also employs cyclonic action to maintain a strong, consistent suction throughout the task. Not only is it great at getting rid of dirt and debris from tile floors, but it is also effective in vacuuming hardwood floors, carpets, and rugs. If you need to clean above-ground areas such as ceilings, just attach the 4-foot flexible extension hose. The vacuum is cordless uses a 20-Volt Lithium-ion battery. This gives you the flexibility to vacuum anywhere you want in the house without having to keep on changing power outlets. Once the charge is depleted, simply place the vacuum on its charging station which doubles up as a storage unit. The maximum charging duration is 4 hours. 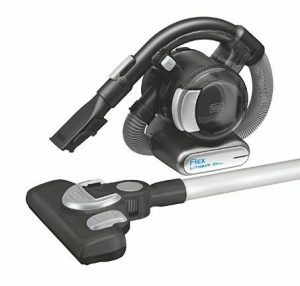 Click here to see the current price of the BLACK+DECKER BDH2020FLFH. SharkNinja products are among the best in the globe. The company has produced all kinds of vacuums ranging from robot vacuums to handheld vacuums to upright vacuums. Name it, SharkNinja has produced it. 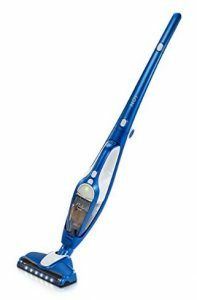 As we were researching on the best Shark vacuums for tile floors, the Shark Flex DuoClean HV391 caught our attention. The vacuum is powerful enough to get rid of dirt from all kinds of floors as well as carpets. This vacuum is great for fighting allergies. If you have pets, I’m sure they leave a lot of hair and dander on the floor. Thankfully, its bristle brush gets hold of pet hair. Also, an anti-allergen complete seal system traps up to 99.9 percent of allergens to prevent them from getting back into the air. The Shark Flex DuoClean also utilizes the MultiFLEX technology. This allows you to bend it and slide it under furniture to reach any dirt hidden there. Also, this makes it easy to store. Simply fold the vacuum over into freestanding mode and tuck it away in your preferred storage area. You can also detach the lower part of the vacuum to convert it into a hand vac to clean stairs or upholstery easily. To find out how much the Shark Flex DuoClean HV391 costs, click here. Another renowned vacuum cleaner brand is Hoover. If you are looking for a vacuum that can do a fantastic job on tile floors as well as other floor types, the lightweight Hoover Vacuum Cleaner Linx will not disappoint you. It can get rid of dirt and debris from tile flooring, hardwood floors, low pile carpets as well as area rugs. Convenience is the name of the game with the SH20030. First, it has a long power cord (20 foot) that allows you to clean a large room without having to move from one power outlet to the other. Also, the vacuum allows you to reach under furniture easily thanks to the extreme recline handle and a low-profile base. Another thing to look forward to is the powerful suction which is maintained at a constant by cyclonic technology. Cyclonic action prevents large debris from clogging the filter. This also helps elongate the washable filter’s lifespan thus saving on replacement costs. 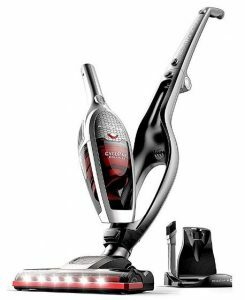 Click here to find out how much the Hoover Vacuum Cleaner Linx SH20030 costs. For those who love canister vacuums, the Eureka Mighty Mite 3670G is an incredible option. It is fantastic for cleaning tile floors, bare floors as well as hardwood floors. However, if there are parts of your home that have carpets or area rugs, you may need to look elsewhere. The vacuum is quite easy to carry around as you clean various areas of the house. Also, its long power cord (20 feet) allows you to clean large areas at a go without having to change power outlets. To prevent damage, the vacuum has an auto shut-off capability that protects it against overheating. A set of accessories is available to make cleaning of stairs, upholstery and other above-ground surfaces a walk in the park. For example, there’s an extension wand which provides a long reach to remove dust from drapes or cobwebs from ceilings and ceiling fans. Click here to see the current price of the Eureka Mighty Mite 3670G. Among the best combo vacuum cleaners for tile floors is the VonHaus EPT2. 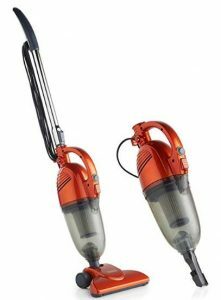 Here, you get both a stick vacuum for extensive cleaning and a handheld vacuum for quick clean-ups bundled into one. To convert it into a hand vac, simply remove the extension tube. Despite the fact that the vacuum is light, it has enough power to get rid of dirt from your tile floor as well as stairs. If there are any allergy sufferers or asthmatic people in the house, this vacuum is designed to curtail frequent attacks. A washable HEPA filtration system is in place to prevent dust, pollen, and other pollutants from getting back into the air. HEPA filtration has the ability to trap up to 99.97 percent of allergens. The vacuum also does a great job picking up pet hair, dander, dirt, grass clippings as well as cat litter. To see the current price of the VonHaus 2 in 1 Vacuum Cleaner EPT2, click here. This cordless vacuum produces a powerful suction that can last up to 24 minutes once fully charged. You can also easily convert it into a handheld vacuum and attach the crevice tool or dusting tool to quickly tackle dirt on upholstery or hard to reach spots. The vacuum is also very easy to use. First, it is light (weighs 10.6 pounds) making it easy to move around or carry as you vacuum the floor. Secondly, LED lights help you see any dust/dirt hiding in dark corners of the room. Being bagless, the vacuum reduces the need to buy and replace vacuum bags. Once you are done with the task, simply empty the contents of the dirt cup into the trash. The Prolux Ion also uses micron filtration system to ensure that no pollutants are allowed back into the air, leaving the house smelling fresh and clean. An advantage that this vacuum has over most cordless vacuums is that it mounts to the charging station. So, it will always be ready to go. Click here to see the current price of the Prolux Ion vacuum cleaner. We also have another 2-in-1 vacuum in our best vacuum for tile floors review. The Roomie “Vincent” can easily be switched from a stick vacuum to a handheld vacuum depending on the task at hand. For example, if you want to vacuum upholstery or stairs, it is more convenient to use the hand vacuum. Also, there are two modes to match the specific task (Eco and Turbo). Eco mode is the best for tiles. The fact that this ultra-light vacuum is cordless gives you the freedom to move anywhere in the house as you clean. When fully charged, you can vacuum for up to 23 minutes. You don’t have to charge every time you need to vacuum. After every round of cleaning, simply place the vacuum on its charging base. Charging automatically stops once the 2200mAh Li-ion battery is full. The vacuum is also easy to push along the floor. It has rubber wheels which ensure that it does not slide off. Also, the floor head rotates up to 180 degrees, making it easy to maneuver around obstacles such as furniture. If there are any dark areas in the room, LED lights on the floor head make it easy to spot any hidden dirt. Lastly, storing the Roomie Tec vacuum is a breeze. You just need to fold it down from the upright position and tuck it away in a corner or in the closet. Click here to see the current price of the Roomie “Vincent”. Looking for the best vacuum for tile floors can be a full day’s work of going through hundreds of products. However, we have taken the liberty to make the search easier for you. We have sieved through numerous vacuums to bring you our top 10 picks tile floor vacuums. A good vacuum for tiles must have a strong suction and wheels that do not slide when vacuuming. Whichever you decide to get for your home among these will be worth your while. We recommend the Bissell CrossWave Pet Pro as the best vacuum for tile flooring. If you are on a tight budget, the BISSELL PowerEdge is the next best alternative. Please feel free to leave any feedback or query in the comments section below.